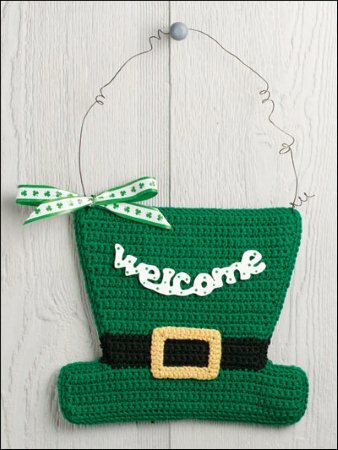 Wish everyone a "top of the morning" with this leprechaun-inspired greeting. Rows 2-8: Ch 1, sc in each st across, turn. At end of last row, do not turn. Fasten off. Rows 10-14: Ch 1, sc in each st across, turn. At end of last row, fasten off. Rows 16-18: Ch 1, sc in each st across, turn. Rows 19-35: Rep rows 15-18 consecutively, ending with row 15 and 36 sts in last row. Rnd 36: Working around outer edge, ch 1, sc in each st and in end of each row around with 2 sc in each corner changing colors as needed to match piece, join with sl st in beg sc. Fasten off. Using 1 Hat Side as pattern, cut 1 piece from plastic canvas slightly smaller. Holding Hat Sides WS tog with plastic canvas between, matching sts, working through both thicknesses in back lps only, join green with sl st in any green st, sl st in each st around changing colors as needed to match, join with sl st in beg sl st. Fasten off. Front of sts are WS of work, with gold, ch 34, sl st in first ch to form ring, ch 1, 3 sc in first ch, sc in each of next 6 chs, 3 sc in next ch, sc in each of next 9 chs, 3 sc in next ch, sc in each of next 6 chs, 3 sc in next ch, sc in each of last 9 chs, join with sl st in beg sc. Leaving long end for sewing, fasten off. Sew Buckle to front of Hat centered over rows 7-16. 1. Paint wooden "welcome" sign with white paint, let dry. Paint green dots on sign as desired, let dry. Glue sign over rows 23-31 on center front of Hat. 2. For hanger, wrap wire around pencil 4 times at random. Insert 4-inches of 1 end from back to front through 1 top corner of Hat, twist once to secure. Wrap rem of end around pencil. Rep on opposite end. 3. Tie ribbon into a bow around wire on 1 corner of Hat.